Jan Marini Age Intervention Duality Review (2018): Is It Worth Buying? Jan Marini Skin Research Age Intervention Duality Review: Does This Acne Cream Really Work? 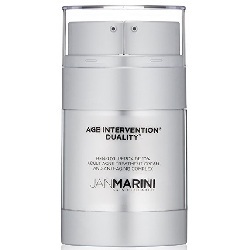 Jan Marini Skin Research Age Intervention Duality, US $93 for a 1 oz. bottle, is a dual treatment solution that addresses adult acne treatment and delivers anti-aging benefits at the same time. About Jan Marini Skin Research Age Intervention Duality — Does It Really Work? This product is brought to you by Jan Marini, the skin care brand that is guided by its trilogy of beauty philosophy, that is, “Complete. Comprehensive. Results Without Compromise.” The California-based company has more than 20 years of experience competing in the skin care industry. The company’s sales strategy utilizes direct selling. The manufacturer claims that their products can treat existing acne and prevent future acne breakouts. It also claims to help reduce wrinkles, fine line lines and inflammation. However, many users claim that the product does not have any positive effect on wrinkles. What Are The Ingredients In Jan Marini Skin Research Age Intervention Duality ? Ultra-Micronized Benzoyl Peroxide (10.0%): Drives down the population of acne causing bacteria found on your skin as it also stimulates exfoliation that sends your skin a message that skin needs to be renewed and repaired so that a newer, unblemished skin may surface. Retinol: This ingredient delivers anti-aging benefits in two ways, that is, it promotes lighter skin and, it smoothens out the appearance of wrinkles and fine lines.This ingredient has long been associated with stinging feeling, flaking, redness and increased sun sensitivity. Peptides: Amino acids that facilitate faster renewal for your skin to reveal a clearer, smoother layer.The company did not state what type of peptide is used in the formulation. Antioxidants: Protect your skin from future damage. Bisabolol: Relieves your skin of inflammation. Jan Marini Age Intervention Duality may be used up to three times daily depending on your skin’s tolerance. This product will require to be gradually worked into your skin. Jan Marini Age Intervention Duality delivers two important functions required by acne challenged adult skin. 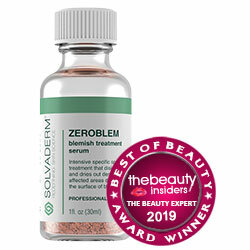 This product uses benzoyl peroxide, a tried and tested treatment for acne. This product contains photosensitizing ingredients. The active ingredient may cause flaking and skin redness. The product is expensive than most of its counterparts. Since it may increase the skin’s sensitivity to the sun, it must be used with sunscreen. Does Jan Marini Skin Research Age Intervention Duality Have Any Side Effects? Skin irritation and allergic reactions due to several ingredients, including retinol and benzoyl peroxide. Increased risk for hormonal irregularities due to BHT. Increased risk for neurotoxicity due to phenoxyethanol. Jan Marini Skin Research Age Intervention Dualityhas the best intentions of adults suffering from acne in mind when it created this dual functioning product. However, sometimes the best intentions may not always lead to the best results. There’s too many potentially irritating products infused in this product that it’s possible for acne to worsen. Currently the health and beauty industry offers a wide variety of acne treatments. While it is important to choose a product that is formulated to function best with an individual's particular skin type, it is also crucial to consider several other factors before purchasing anti-acne products. More specifically, the best acne treatments should be able to penetrate deeply into skin. At the same time, a quality acne treatment will also contain ingredients that can minimize the appearance of skin's pores, clear up any facial blemishes, and actually remove dead skin cells as well as black and whiteheads. Below are some of our most effective acne treatment products on the market today; each product is evaluated on how well it matches up with the previously explained requirements for a quality acne treatment.